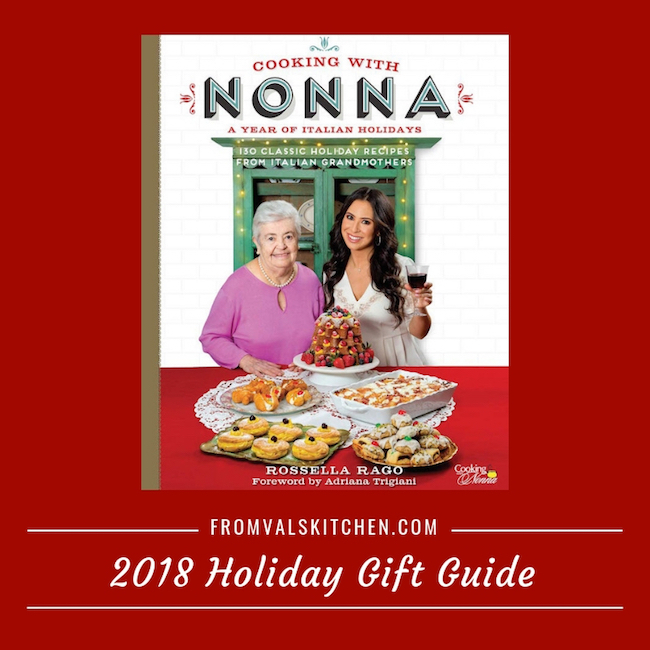 2018 Holiday Gift Guide – Cooking with Nonna: A Year of Italian Holidays: 130 Classic Holiday Recipes from Italian Grandmothers with Cannoli Cookies recipe. I’ve always loved Italian food. Growing up I liked an Italian boy. One of the things I enjoyed about going to his house, especially during the holiday season, was the food. So much yummy food! If you’re looking for a gift for someone that loves to eat or cook Italian food, or enjoys entertaining, be sure to check out Cooking With Nonna. The product(s) featured in this post was provided free of cost to me. Please note that, as always, any personal opinions reflected in this post are my own and have not been influenced by the sponsor in any way. Some of the posts on this site, such as this one, contain an affiliate link. This means I MAY get paid a VERY SMALL commission if you purchase the product or service. With advice from nonnas all over the country, this unique book covers holiday classics from every region of Italy, from Milan to Sicily, and includes holiday memories from the nonnas themselves. The nonnas also give their personal tips on cooking for a crowd (and it’s always a crowd). And, of course, no new Cooking with Nonna cookbook would be complete without Rossella’s signature dishes and unique voice. Rosella and her nonnas will have you enjoying Italian culinary delights around the year. In addition to the major holidays of Christmas, Easter, and Thanksgiving, you will find recipes for New Year’s Eve and Day, the Epiphany, Little Easter, St. Joseph’s Day, Carnevale, All Souls Day, Valentine’s Day, Women’s Day, Mother’s Day, and Saint Rocco’s Feast. To complete you year-round Italian tasting tour, recipes for weddings and other celebrations are included. 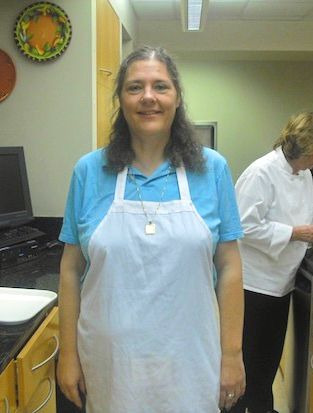 Rossella Rago is the host of the popular web TV series Cooking with Nonna. For each episode of the show, Rossella invites an Italian-American nonna to cook with her and share traditional Italian recipes and fond memories of her childhood in Italy. Here’s a recipe from the cookbook, excerpted with permission of the publisher. I didn’t think it was possible to get all the flavors of a cannoli in a single cookie, but guess what? It is! Nonna Romana and I jazzed up her classic ricotta cookie recipe with notes of orange and cinnamon, before adding some yummy pistachios and chocolate chips to the batter for crunch and texture. I love decorating these with a gorgeous, thick white glaze and different-colored candied cherries to put everyone in the holiday mood. Preheat the oven to 350°F (180°C). Line a baking sheet with parchment paper. To make the cookies: In a food processor, process the pistachios until coarsely chopped, 15 to 20 seconds. Transfer to a small bowl and set aside. In the bowl of a stand mixer fitted with the paddle attachment, combine the granulated sugar, butter, vanilla, cinnamon, and orange zest. Beat for about 5 minutes on medium-high speed until fluffy. Add the egg and ricotta. Beat again on medium-high speed to combine. Add the dry ingredients, little by little, and beat on medium-high speed until a dough forms. Mix in the pistachios and chocolate chips. Using a tablespoon (15 g), portion the dough, roll it into balls, and place 2 inches (5 cm) apart on the prepared baking sheet. Bake for 10 to 12 minutes. The bottoms of the cookies should be slightly brown. Cool completely before glazing. To make the glaze: In a medium bowl, mix together the confectioners’ sugar, milk, and vanilla until a smooth glaze forms. Add less milk for a thicker glaze or more for a thinner glaze. 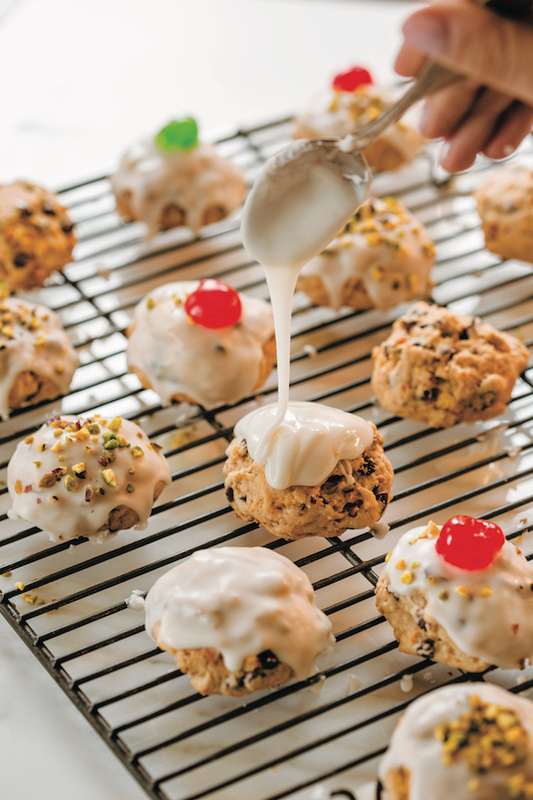 Spoon the glaze over the cookies and decorate with chopped pistachios and candied cherries as desired. You can learn more about these titles and others on the Quarto Race Point Publishing website. You can also keep up with Race Point Publishing on social media, on Facebook, Twitter and YouTube. Your Aunt Toni made the best Italian cookies ever from scratch. I’ve been to their website! They are from the area close to where my parents are from in Italy. Their recipes are close to home.